Mustard seed from India is the source of most mustard oil. This seed variety is more pungent and hotter than Mediterranean mustard seeds. Use mustard oil as a flavorful addition to your cooked dishes by heating it first. Once the oil reaches its smoke point, it develops a subtle, mellow flavor. Like any other oil, mustard oil adds calories while enhancing your favorite recipes. The standard serving size for oils is 1 tbsp. When you cook with oil, you may likely use more oil in the pan, but cooking quickly reduces the amount of oil that your food absorbs. If you plan to use this oil for salad dressing or sauces, the standard serving is 2 tbsp. Mustard oil contains 124 calories per tbsp. It contains 14g of fat, which contributes to all of its calories. The fat in mustard oil, which equals 8.3g per tbsp., is mostly monounsaturated. The polyunsaturated fat content in 1 tbsp. equals 2.9g, while the saturated fat content equals 1.6g. 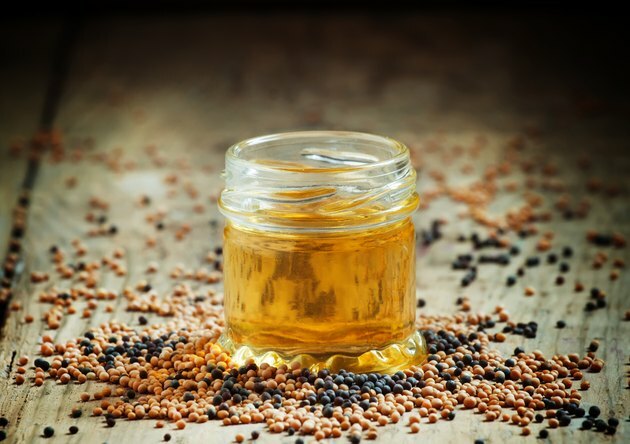 In comparison to other popular cooking oils, mustard oil has a lower monounsaturated fat content than olive, flaxseed, grape seed and peanut oil. A tbsp. of mustard oil has no carbohydrates, fiber or protein. It does not contain any vitamins or minerals. Like other vegetable sources, Mustard oil contains alpha- linolenic acid or ALA, an essential omega-3 fatty acid. This acid in the oil's polyunsaturated content is one that your body cannot make. You must get it from food. Omega-3 fatty acids act as antioxidants, which help your body fight off diseases, protect heart health and possibly keep brain cells healthy. One tbsp. of mustard oil contains 0.8g of omega-3 fatty acid, compared to a tbsp. of soybean oil, which has 0.9g. Canola oil has 1.3g and flaxseed oil has 7.3g. The U.S. Department of Agriculture's 2005 Dietary Guidelines for Americans recommend that you limit daily oil consumption to 6 tsp. or 2 tbsp. in a standard 2,000-calorie diet. This includes all oils that are liquid at room temperature, whether you use them for cooking or in salad dressings.